Thank you so much for the lovely replies to my last post, about what kind of blog I have (or don't have). I appreciate what you said. I have a lot of fun with blogging and that's what really matters to me. I've met wonderful people through blogging, have had some really nice (and totally unexpected) recognition now and then, and have just generally enjoyed expressing myself in words and photos. Of course, I'm very glad my blog resonates with people out there. Thanks for the encouragement and inspiration. I have a new project to share today. Backing up a little bit first, I've given myself permission to stop worrying about crochet for as long as it takes to feel inspired again. I put a lot of pressure on myself in most areas of my life, even my crafty hobbies, and I'm really trying to change that. I like to get projects done, but it's important to savor, enjoy, stop and smell the roses, and all that. The blanket I still hope to make will probably be my last one for a while, I've decided. I've made a lot of blankets over the past four-plus years since I really started crocheting in earnest - eight of them for our household alone! The new blanket will be a large one for our queen-sized bed, an extra layer at night in cold weather, and a colorful cover during the day. This blanket will be a good addition, but I think we've got plenty of them otherwise. 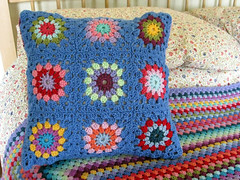 I think my crochet future, at least for now, holds a lot of smaller projects like pillow covers, decorations and toys. 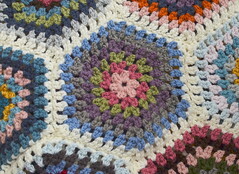 Crochet has been a wonderful addition to my life these past few years, but there is no need to be a crochet machine. Whether I crochet a lot or a little, I believe that the benefits are here for good - they're part of who I am now. I recently started this cross-stitch design, a colorful, whimsical pirate ship. The design is Voyage, from Satsuma Street, a modern cross-stitch pattern shop on Etsy. If you haven't seen Jody's shop yet, I strongly encourage you to take a look (I have no connection to the shop, I'm simply a huge fan of Jody's work). I love every design in her shop and have purchased a few over the past few years. This is the first one I've actually started making so far, but I have Big Plans, let me tell you. Isn't this design fun? I love how colorful it is. The stitching itself is pretty straightforward - just basic whole crosses - but I really enjoy the intricacy of the design. It's a bit different from my last stitched piece, Retro Kitchen, in that the areas of color are smaller. I liked the big blocks of color in Retro Kitchen, but I like this too - it keeps me on my toes. I haven't stitched much yet, as you can see from the top photo, since I've been so busy with kids' stuff lately, but the bit I have done has been relaxing. I do so love my stitchy time. Jody stitched the ship on black Aida but I've decided to use navy blue for mine. I was glad to find some at Hobby Lobby; they have a limited selection of colored Aida cloth there. I thought the blue would work better in the family room, where I plan to hang the finished piece. We have dark blue-upholstered furniture in that room. For flosses, I tried hard to match up similar colors from my own stash, as opposed to buying every color in the chart (there are quite a few colors in this design, as you can see). Luckily, I was able to find almost every one of these in my stash! Some are wound on bobbins, leftovers from previous projects, while others are still in skein form. I took numerous skeins from my antique sewing basket full of old flosses, a gift from my in-laws (you can read more about this sewing basket here). I have some really interesting flosses in there, actually, and it's always fun to sort through them. I've never heard of a few of the brands anywhere else; I've got Rose brand, with Chinese on the label, Mez brand and Semco, in addition to Anchor and Coats & Clark. I only bought a few new skeins, plain white and a few blue and peach tones. I think the mix is great - there are bold, bright colors as well as soft, pale ones. Pirates, and their proud seagoing vessels, are nothing if not motley! I'm planning to hang the finished piece in the space at the bottom left of our gallery wall in the family room (look! There's a little slice of Retro Kitchen in the yellow mirror). There should be plenty of room among these modern scrimshaw engravings of me buccaneers. I'm thinking about going slightly gaudy for the frame - something gilded and scrolly, maybe, pieces-of-eight style. Yo ho ho (and other piratical exhortations)! You are the best source for cross stitch patterns! First you got me onto Stitchrovia and now Satsuma Street. I love both of these designers! Crafting should not be filled with pressure. I have found that sometimes I feel pressure to knit more because of my blog. I try to ignore that because I know it's not how I want my knitting and blogging to work. oh how fun!!! I think the navy background is most fitting and lovely! and the idea on frame sounds perfect for the wall, a bit of contrast that will yet fit in swimmingly! how fun! Yes, I agree, we must try to learn to not pressure ourselves so much about things. I have a blanket and 2 quilts waiting for me, but I don't seem to get to them - not that I don't want to - but other priorities keep popping up that I have to attend to first.... but I live in hope. I keep wondering where my time goes. Well, actually I spend too much on social media sometimes but am working on it. I love that we can have online contact with those, like yourself, who then become 'blog friends' of which I for one tell my husband of and for him, he can never keep everyone strait ;) Have a peaceful night! Beautiful design, it looks great on the blue. Love cross stitch, about go blind when I do it. Love the pirate ship design and it is going to be lovely when you finish. I too love doing cross stitch and find it addictive and fun to see the picture come to life. How fun! I have a new top-secret project that I would love to share with everyone, but since it's a gift for Mandy I can't put it on my blog. Suffice it to say that I'm really enjoying it, just like it sounds as if you're enjoying cross stitch right now. Different crafts work at different times in our life. We wouldn't want to do them if we felt pressured. Crochet will be there when you have that urge to pick up the hook again. I switch back and forth. 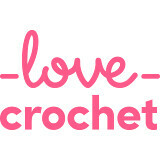 Crochet, knit, cross-stitch, sewing. Whatever I feel the need to make at the time. That pirate design is wonderful. Love the colors and the vibrancy of the whole thing. Good for you for giving yourself a break with the crochet. I have the same type of personality, and end up pushing myself and then not enjoying things as much. You are making me miss cross stitch though! I am a wannabe stitcher, I love the look of cross stitch and even bought a beginners kit. Sadly it is languishing in the back of my cupboard, like you I have been on a marathon but in my case it is quilting. I have two on the go at the moment and two more in my head. Once they are done I plan to take a whole month to get to grips with stitching on a small scale. That Pirate ship is glorious, I do like a riot of colour. I'm feeling exactly the same about my crochet at the moment, it's been put away until I feel the need to drag it out again and in the meantime, I'm concentrating on my cross stitch. I like the design you've chosen, lovely and colourful, it will certainly hold your interest. Your new cross stitch piece will be perfect on the gallery wall! I think it's a good thing that our interests and passions change over time. As long as we love what we are doing, that's what's most important. That very fun design will look perfect in that spot on the wall. I love the family photo, you are all so gorgeous. This looks as if it is going to be a lot of fun to stitch. I love all the colours and your choice of fabric - an ink blue sea is a good choice for a pirate ship. I'm still thinking about the frame for Midsummer Sprigs which I finished a couple of weeks ago, mostly using my stash of embroidery silks. I am really pleased with my choice of confederate grey linen for the background and think a simple dark wooden frame will contrast well with the grey. It is good to make these off the shelf projects our own. Blogging has rather paralysed me lately - just too much to keep up with and not enough time, but I do like coming here for a peep into your contented and grounded life Jennifer.